There's not much better in this world than sitting down to eat a perfectly grilled, tender, and juicy Porterhouse or T-Bone steak. There are many opinions and techniques available regarding the best way to master cooking a steak including whether or not to marinade or use a rub, how long the steak should be grilled, and how to correctly grill the steak. In my book there is only one way to grill a steak, and you will find instructions below for grilling a Porterhouse steak, which will also work for a T-Bone steak. This method of grilling a steak can be done with any steak cut, but I chose to refer to a Porterhouse steak. 1. The first step is to choose a great cut of meat to grill. You will probably need a good butcher's help to do this. He or she can cut the steak for you. Choose a steak that is at least 1-inch thick, up to 1.5 inches thick. The Porterhouse needs to be fresh, not previously frozen, and it should be a nice, bright red color. 2. Look for Marbling. This is the way the "taste fat" is incorporated throughout the steak. When judging if a steak has good marbling or not, look for thin streaks of fat that run throughout the steak. More fat equals a tastier steak, but it will be less tender. Less fat equals a more tender steak, but it won't be as juicy and tasty. When you marinade a steak, you are not trying to change the flavor of the steak, you are trying to compliment the delicious, natural flavors produced by grilling and already present in the meat. You do not have to use a marinade, but a good marinade will help in tenderizing the meat. A marinade is used to tenderize a steak and add a little flavor. The key tenderizers in this marinade are red-wine vinegar and the dark beer. If you do not prefer to use beer, substitute with 1/4 cup of red-wine vinegar. 1. Remove the steak from the marinade, and let it sit for about 1 hour before you grill it. This will bring the temperature of the meat closer to room temperature. 2. Before lighting the grill, spray on pam to prevent sticking. 3. Gas Grill Method: If you are using a gas grill, hopefully it has two burners. Heat the grill by turning one of the burners on high, and the other on medium-low. This will allow you to sear the steak and seal in the juices. Place the steak on the hot side of the grill for 1.5-2 minutes. Turn the steak over and cook for 2 minutes. Move the steak to the cooler side of the grill and cook it for about 7-8 minutes for medium rare. The internal temperature should reach about 135F degrees. 4. Charcoal Grill Method: Build a fire in 1/2 of the pit, and let the charcoal burn down; they will turn white, and you should not be able to hold your hand over the top of the grill for more than 1-2 seconds. Place the steak on the hot side of the grill for 1.5-2 minutes. Turn the steak over and cook for 2 minutes. Move the steak to the cooler side of the grill and cook it for about 7-8 minutes for medium rare. The internal temperature should reach about 135F degrees. 5. 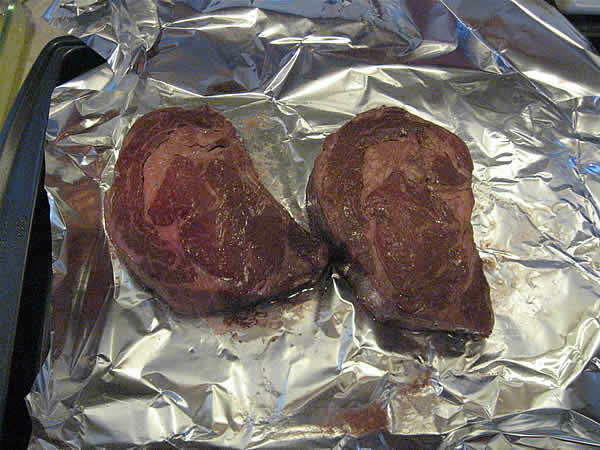 Let the steak rest by placing it on a plate and covering it with foil for about 2 minutes or so. This will help in making the steak tender and juicy because if you cut the steak too early, the juices will be hot, causing them to ooze out. 1. Sauteed mushrooms and onions are two of my favorite steak toppings. 1. Heat 4-TBSP of butter in a non-stick frying pan. 3. Add mushrooms and cook for another 4 minutes or until onions are opaque. 2. Add 1-2TBSP of Soy sauce or Worcestershire sauce to butter.